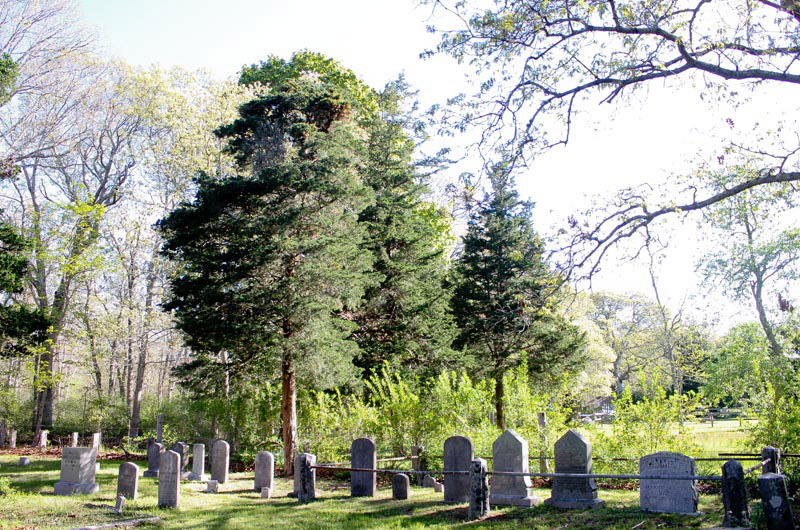 Protected special way leads to old cemetery in West Tisbury. A pair of homeowners on Rogers Path in West Tisbury will be required to move a fence they built on the specially protected ancient way. At a well-attended public hearing last week, the town zoning board of appeals upheld a decision by the building and zoning inspector ordering Scott Bermudes and his wife Cynthia Cornwall to remove fence posts that were installed three to four feet from the center line of the path. Mr. Bermudes said the fence replaced an existing fence he had installed in 1995 because of problems with trespassers. The existing fence ran 300 feet along Rogers Path he said, and he wanted to continue it for another 350 feet. Once a cart path that connected Middletown and Christiantown, Rogers Path also leads to a town cemetery, where some headstones date to the Civil War. The path is about a mile long, running past a handful of private homes. It has been permanently protected as a special way by the town and the Martha’s Vineyard Commission, and survived court challenges in 2010 and 2011 over its historical use as a public way. Fences, walls and excavations are prohibited 20 feet on either side from the center line of the path. Zoning inspector Joseph Tierney Jr. notified the homeowners in early February that the fence violated the bylaw. “It seems really straightforward, no one is stopping you from building a fence, just put it 20 feet back,” said zoning board member Anthony Higgins Jr. said at the hearing last week. Mr. Bermudes said the bylaw allows for gates, bars or stiles to be built, and he interpreted that to mean a fence. He said not being able to put in a fence restricts his ability to use his land for agricultural purposes. His property already has an electric fence set back from the path to contain livestock. “We’re going to put up woven wire, we breed pigs we breed ponies — baby ponies don’t stay in an electric fence, they need woven wire,” he said. About 15 people attended the hearing, and the board had received 20 letters about the issue, most of them advocating for removal of the fence. During public testimony the discussion grew heated at times as neighbors described clashes with Mr. Bermudes. But in the end board member Tucker Hubbell said the only question before the board is whether to uphold the zoning inspector. “I think we could listen to testimony and we’ve had a ton of letters, but it really comes down to, from the perspective of this board, did the zoning inspector make the correct call and in my opinion he did,” he said. Sometimes good fences do not make good neighbors. A few years before Herb Putnam died, he and his friend Peter A. decided to clean up that cemetery - privately, they worked to stand up the headstones and clear the brush and mow. Herb believed the cemetery should be respected and the way to it protected. He would be pleased to know the Town supported this.